Nothing bonds co-workers better than working together in the great outdoors. We’ll help you set up the perfect set of activities for your group. This top notch facility is a complete destination for groups whether large or small. They will provide the environment to regenerate and inspire. The overall experience is a reward in and of itself and the meeting facilities includes the newly renovated Great Room featuring comfortable seating as well as other meeting places both indoor and outdoor. With adventures plentiful for all seasons, corporate team building events have never been better – or more complete. First class amenities including luxurious accommodations make this hunting and fishing Preserve the perfect destination resort for your corporate event. 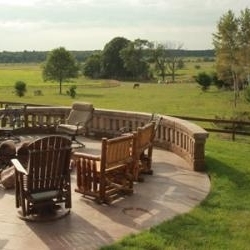 This hunting preserve and ranch gives you a chance to explore the true nature and beauty Wisconsin has to offer. Nestled in the heart of Wisconsin the pristine preserves are populated with some of the highest quality, privately raised big game wildlife, we’re known worldwide for our hunting packages. 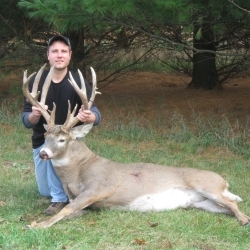 Hunters come for the incredible whitetail, elk, and fallow deer trophy bucks. From the moment guests enter the ranch, it is clear it will be unlike any other hunting experience. Several species of world class big game range freely on over one square mile of perfectly managed hunting preserve. 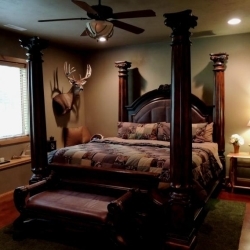 Specializing in world class trophy whitetail deer hunts, trophy elk hunts and trophy Fallow hunts, this facility offers professional one-on-one guides, first-class accommodations and an experience the whole family can enjoy. Their guided whitetail hunts and guided elk hunts ensure guests will experience a trophy big game hunting adventure that won’t soon be forgotten! From thoughtfully appointed hunting lodges, to delicious cuisine, to a wide range of outdoor activities, we have something to appeal to every member of any group or family with personal attention to every detail of your stay. Wake up to a delicious country breakfast and then hunt trophy-level game, including whitetail deer, elk and fallow. This elk and deer hunting preserve offers pristine grounds with some of the highest quality game hunting in all of Wisconsin. 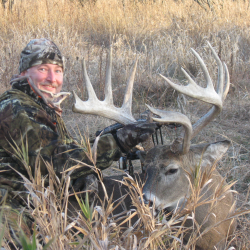 The outfitter and staff will do everything we can to ensure you have an incredible hunting vacation. They also guarantee your outing will be successful with 100% shot opportunity, field dressing and other amenities. 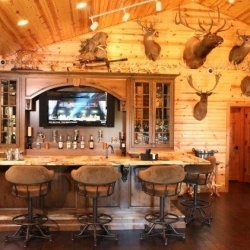 To make sure your hunt is comfortable; they provide extras including heated hunting stands and other special touches. Every hunter who visits the hunting preserve is assigned a private guide and they have spared no expense to provide a memorable hunting experience. Enjoy the comfort of deluxe, fully enclosed hunting stands—all insulated, heated and carpeted with sliding windows, hunting blinds, swivel leather office chairs, German binoculars and spotting scopes. Their elk and deer preserve is stocked with homegrown Whitetail, Elk, and Fallow deer. 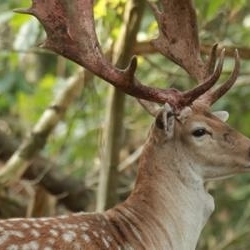 Interested in a Trophy Fallow Deer! A trophy you will be proud to hang on your wall! They offer chocolate, spotted or white fallow buck hunts. The Fallow hunting is first come first serve and the outfitter takes great pride in only allowing 25 Fallow Bucks to be harvested per season ensuring each hunter will have a true trophy experience! They can accommodate hunters of all ages and experience levels as well as disabled hunters. 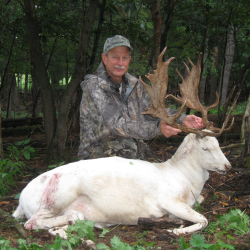 Our Fallow hunts are fully 1×1 guided and our guides have experienced a 100% success rate! Trophy fallow hunt for only $3495! Fallow deer have been hunted for over 2,000 years. They are an extremely hardy and elusive species being extremely adaptable to a variety of climates. Adult males range from 35-38 inches tall at the shoulder and weigh between 175 to 225 pounds. There are 4 primary colors of fallow deer. They range from a tan or rust color with white spots or can be seen as a creamy white, grayish brown or very dark brown color. Their highly sought after antlers are palmate, similar to those of a moose, with several large tines which grow anywhere from 15 inches up to a trophy size of 28 inches in length. The fallow deer’s meat is extremely lean containing only about 5% – 7% fat and is very succulent with only a very mild venison flavor. If you are planning a trophy elk hunting trip this year, why not come to Wisconsin in the middle of an elk hunters paradise! This facility takes great pride in our herd by only allowing 20 elk to be harvested per season ensuring each hunter will have a true trophy experience! No need to wait to draw a tag, no license is required to hunt on our private ranch! 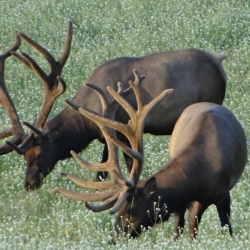 The most popular time to hunt elk to hear the majestic call and bugling is late August through the end of September. Whether you’re an experienced caller or a novice bring your calls along and call in the elk with your guide! They harvest 6×6 or larger bulls only. In the past we have averaged 370″ bulls, with many bulls going over the 400″ mark each year. You’re not paying by point or score or for any trophy fees, rather, you are harvesting the biggest animal that you desire in a fair chase environment. During your hunt, each time you go out to sit it will be another great experience! Sit and relax by the fire nightly and listen to the elk bugle! You can use the weapon of your choice and hunt from a heated condo stand, a ladder stand or ground blind! You choose. They can accommodate hunters of all ages and experience levels as well as disabled hunters. 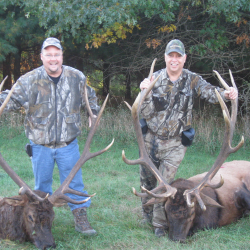 Our Elk hunts are fully 1×1 guided and our hunters have experienced a 100% success rate! 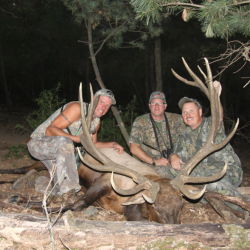 Your next trophy elk hunt in Wisconsin is only $8800! The welcoming great room with vaulted ceilings boasts hardwood floors, fireplace, rustic dining table and a custom crafted bar. A large screen television airs favorite shows or sporting events. Refuel with all meals prepared in the commercial kitchen and served in a comfortable home-style dining area. It is the ultimate in comfort, convenience, beauty, not to mention affordability year round. The main lodge has four rooms all with their own private bathrooms and is in the same building as the bar and dining area. Come and stay in this lodge equipped with a full kitchen so you can bring your own food and prepare meals for you and your family. This beautiful lodge consists of four rooms and two bathrooms great for a large group or family. Beautiful private cabin with a large hot tub room, and large living area. Has loft bedroom for the kids and king bed for the adults! Stay in the Safari Suite and enjoy stunning views of the wildlife! Imagine camping right in the middle of paradise- Rising with the sun seeing the animals interact in their own natural environment right from your screened in porch or off your deck of your tent suite equipped with first class amenities.